Table of Contents Next: Willis, Algernon U. Light antiaircraft eventually upgraded to 8 20mm Oerlikon AA guns. 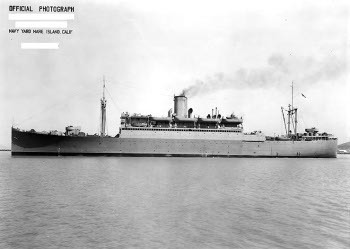 The William Ward Burrows was a former Grace Line ship, Santa Rita, taken into the Navy in 1940 as a troop transport. When war broke out, she was two days west of International Date Line en route to Wake, carrying 33 Marines, 60 sailors, 55 civilians, and 1819 tons of cargo, and towing a barge (which reduced her speed to 8.5 knots).